Church of the Palms lives its mission statement: “Sharing God’s Unconditional Love, Justice and Extravagant Welcome.” This is evident in many ways, but no more so then in the Rummage Sale. What are the benefits of all that hard work and who really benefits from a Church of the Palms Rummage Sale? Here are some of the beneficiaries: New Life Shelter (domestic violence victims), HART Pantry (homeless teens), Justa Center (homeless seniors), Disabled Veterans, Downtown Phoenix homeless shelter, Solutions Church (African refugees), Asylum Seekers from Central America, CASA, Navajo Reservation, Children First Academy, Charity Recycling (supporting Boys & Girls Clubs). Oh, by the way, don’t forget: 20% of the proceeds of the sale go to our Board of Mission and Outreach and all the other organizations they support. But what are the direct benefits to the Church of the Palms? 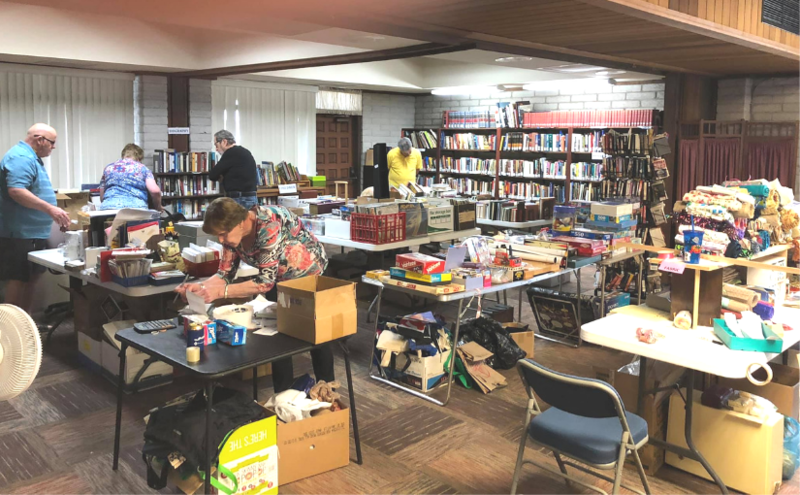 The Rummage Sale, like our Community Thanksgiving Dinner, allows us to “Be the Church.” These events build and strengthen the sense of community that permeates the fabric of our church. These activities help us make new friends and build relationships. But what about the money? Well, 80% of the $19,000 in sale proceeds, or about $15,000 this sale, stays with our church and is used to maintain and improve the building in which we all gather to worship God and share fellowship experiences together. Oh, it’s just a rummage sale. Hardly!! Thanks to the “donaters,” the workers, the buyers. We love you all! !